From sleek cabinetry to sophisticated color schemes, contemporary kitchens blend modern design with a minimalistic aesthetic to create a distinctive look that transcends trends. Think flat front cabinetry, sleek fixtures, stone features, wood accents, and stylish tile. If you are hungry to learn more, our favorite contemporary kitchens will inspire you to chef up your own unique cooking space. There are many contemporary features in this Danish Kitchen by Nicolaj Bo that make the cooking space feel warm and inviting. First, there is the slate blue cabinetry with a sophisticated matte finish that makes the room feel cozy. There is also a wood hexagon tile backsplash that transforms a white wall into an exciting feature. If you are looking for an affordable way to personalize any area in your home, consider flowers. Here a vase full of fresh cut blooms enlivens things with living color. This gorgeous contemporary kitchen by Lucy Interior Design features dark wood cabinetry that resembles living room furniture and a spectacular 3D backsplash. Unique pendant lighting not typically found in cooking spaces adds to the kitchen's luxurious feeling. Colorful cabinetry and an eye-popping backsplash are the two primary features that give this contemporary kitchen by Honeycomb Design and Build a playful vibe. Slab doors as shown on the two-toned cabinets in this cooking space by Idea Space are a hallmark of the contemporary style. The marble-patterned quartz countertop and matching backsplash add both timeless beauty and practical function. Cool-toned kitchens can feel a little chilly. Here walnut shelves add a splash of warmth. In this daring kitchen by interior designer, M.J. Lanphier, bold, graphic floor tile and two-toned, stained wood cabinetry blend function with style. A white kitchen by Soda Pop Design feels thoroughly contemporary thanks to sleek cabinets and a quartz waterfall kitchen island. Gray tiles, a marble oven backsplash, and dark wood cabinetry break up the mostly white space with interesting texture and pattern. Custom wood cabinets stained black set the tone for a contemporary kitchen by Space Craft Joinery. Behold the wood tile backsplash whose bold pattern personalizes the space. Natural wood features such as shelving or countertops are often paired with slick, glossy cabinets in contemporary kitchens as shown in this example by Atticus & Milo. Who says bead board or shiplap is only for modern farmhouse kitchens? Here painted wood paneling feels ultra contemporary. We also appreciate the blue arched ceiling in the hallway, which connects the small cooking space to the rest of this apartment designed by Colombo and Serboli Architects. Lovely, birch-faced-plywood cabinets, blue rubber flooring, and stainless steel appliances are the essential contemporary ingredients in this family-friendly kitchen by The Paper House Project. All of the cabinets are movable, which add loads of flexible function to the cooking space. Pale blue cabinetry keeps the appliances out of sight in this New York City kitchen by Studio DB. Fixtures and hardware in gold elevate the cooking space's minimalistic appearance. Interior designer M.J. Lanphier created a kitchen that blended with the rest of the main living area in this open concept apartment by adding decorative pieces like the black sculpture and table lamp. The marble front on the kitchen island enhances the elegant vibe. Here, the design team at Idea Space added contemporary flair to a cooking space by adding colorful brick tile from the counter to the ceiling. Contemporary kitchens that feel more like living areas than cooking spaces are a welcoming decorating trend. This chic example by Alys Design combines a cozy dining space with custom cabinetry. Behind the pristine white doors are large appliances and a sizable pantry. If sleek, lacquered cabinetry is not your thing, take in this contemporary kitchen by Vidal Design Collaborative. The colorful cabinets and warm wood fronts give the cooking space a mid-century-inspired appeal. Kitchens are often the focal point of open concept spaces. But if you want your cooking space to blend in, consider slab front cabinetry in a warm wood tone. The cabinets in this kitchen by Vidal Design Collective matches the living room furniture. Bold patterns and exciting colors can enliven any kitchen. 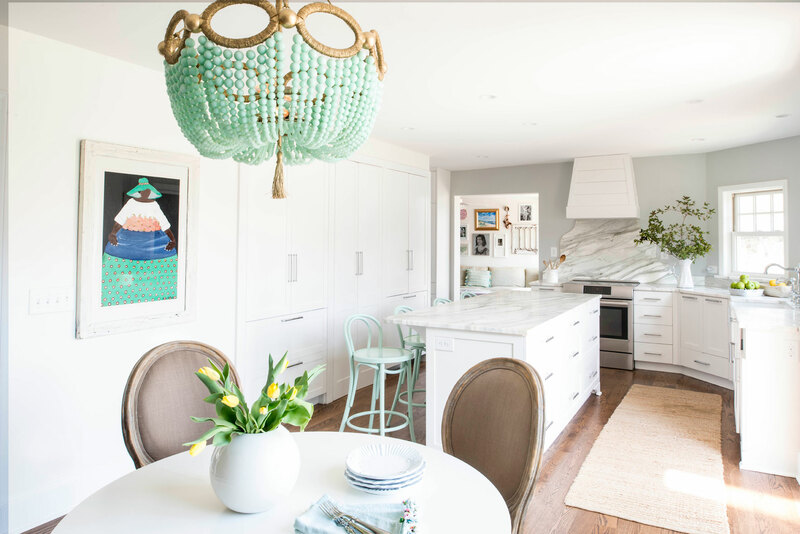 Here interior designer Annie Grierson gave a traditional cooking space a huge contemporary lift by combining contrasting patterns with bright hues. 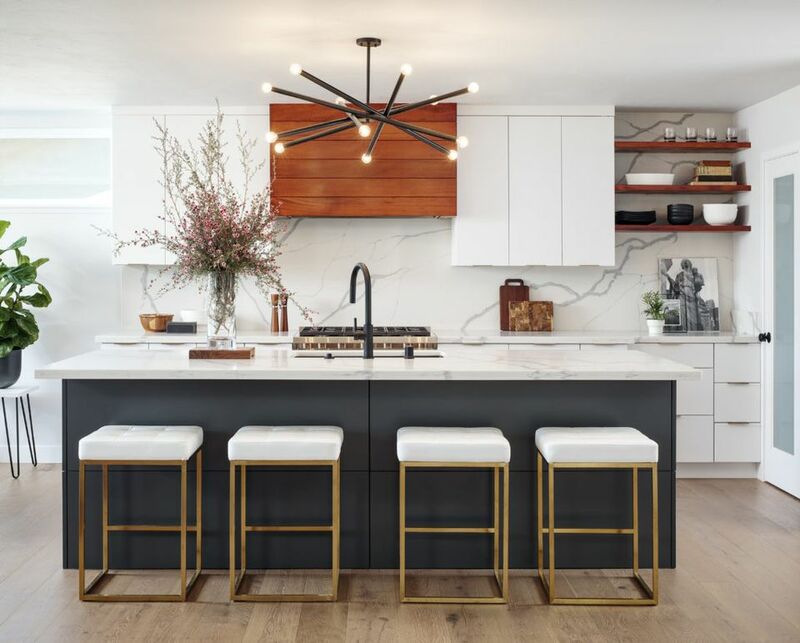 A lovely kitchen by White Arrow Interiors mixes clean lines with luxurious materials and soft colors to great a space that is both stylish and secretly functional. For instance, the powder blue cabinetry conceals refrigerator drawers. Then there is the marble waterfall-edged countertop, which is tricked out with a chic and practical brass toe kick. White, contemporary kitchens can feel a little cold or sterile. Here, Synergistic Development solves the problem with natural stone features like the soapstone counters and slate backsplash. Porcelain tile in a bold geometric pattern and living greenery brighten up a contemporary black kitchen by Tiny Monster Design. The best family-friendly kitchens, like this contemporary example by Rachel Madden Interiors, blend durable materials with inviting features. Quartz countertops and natural wood tones give the cooking space a crisp and natural vibe. We also appreciate how the white upper cabinets seemingly disappear into the white tile backsplash. The visual trick enhances the room's relaxed and uncluttered good looks. The custom paneled oven hood and wood shelves add natural warmth to a contemporary kitchen by CM Natural Designs. White walls, tall ceilings, and glossy cabinetry make the tiny kitchen in this small home by interior design firm Suba feel much larger. The marble countertops and matching backsplash lend polish to the place. Black and blue are the primary colors in an urban kitchen by Black Lacquer Design. The marble countertops seeps with a dramatic pattern. Another exciting feature is the modern, glass door refrigerator, which puts its contents on display. Black paint is what separates this contemporary kitchen by Ban Architecture from the rest of the living space. Wood features including the maple counters provide striking contrast.